As the holidays approach, if your home is anything like mine, it will be filled with the laughter and cheers from friends and family. As loved ones come from far and wide, you’ll want your home to be a place of warmth and festivity. 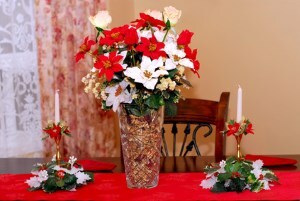 Capture the excitement of the holiday season with a few simple décor swaps to transform your living spaces. No matter if you’re spicing up your guest bedroom or brining holiday cheer to your living room, updating your interior décor with new window coverings, bedspreads or pillows allows you to capture the true spirit of the holidays. If you're looking for a flexible, elegant way to decorate your windows that is a step up from the average window blinds, cellular window shades make a lovely option for your home. 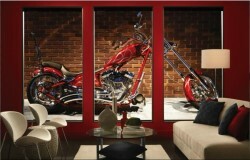 They have a clean, modern look that can complement décor and that offers many options for lighting, style, and more. Let's learn a little bit more about these clever window coverings. What is a Cellular Window Shade? 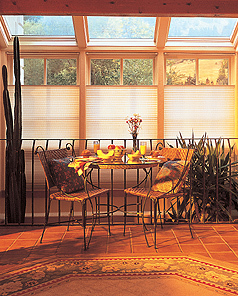 A cellular window shade is a window treatment made of fabric sewn together in a "honeycomb" pattern. The honeycombs form small cells that trap air, which provides insulation. The layers of fabric also filter light, and can be customized for your ideal room lighting needs. Get Ready for Winter with Custom Window Treatments! It's definitely getting colder here in Colorado Springs, which means it is time to get your home ready for winter with custom window treatments. Don't let your first monthly heating bill surprise you! Windows are one of the greatest sources of heat loss in a home and they are also very expensive to replace if they are old or poorly insulated. There are so many more affordable ways to keep your home insulated and your energy bills low, simply by decorating your windows with custom treatments. Here are a few ideas to help you get started. The only thing I love more than creating a beautiful set of draperies, is decorating them with the many different accessories available, including fall's favorite window treatment trend, drapery medallions. If you're dressing your windows to impress, there are few accessories that add as much drama and interest as the gorgeous and intricate look of drapery medallions. Window blinds are no longer the same old generic plastic stand-by they once were, there are new ways to decorate with them being designed every day. That's exciting news for anyone looking to create a new window treatment for their home. Modern window blinds in wood, woven naturals, and customized graphic designs are making common plastic treatments a thing of the past and they can be created with standard bottom up, top down/bottom up, cordless, motorized, and even vertical opening styles. Of the four seasons, fall offers the richest and most vibrant color palette around—especially when it comes to decorating with custom window treatments. Deep reds, soft golds, and mellow oranges allow us to bring autumn's beauty into our homes, reflecting the change of the trees outside. And speaking of change, fall also ushers in the chill of winter, which means, if you plan correctly, your new décor can also be an opportunity to save on heating costs. Isn't it great when a new look can also be practical? 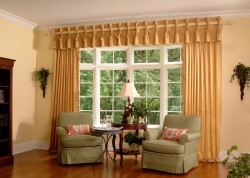 Let's look at the latest trends for fall window treatments. 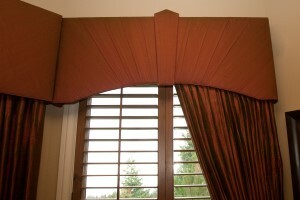 Fall Colors are in for Drapes, Panels, Cornices, and Valances! Create a warm and beautiful new look for fall by adding drapes or panels in the latest fall colors, or updating your existing window treatment with an autumn-inspired valance or cornice. What colors are in this year? Think of a family day out at the local farm during harvest season! Lovely apple reds, deep pumpkin oranges, lush earthy browns, and golden leafy yellows are trending right now. 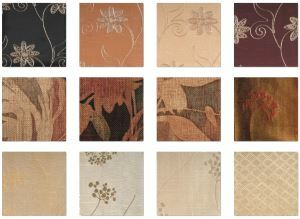 You can add them to your home with solid-colored draperies, or weave them together with a unique patterned fabric. You can even coordinate your bedspreads and accent pillows to complement your window treatments.